Corsair's Hydro Series H5 SF is a low profile closed-loop CPU cooler, making it the company's first foray into liquid coolers that'll fit inside a Mini-ITX PC. According to Hexus, the H5 SF has a high-pressure, low-noise 120mm fan which spins between 1,000 and 1,800 RPM, and it'll mount to any Mini-ITX motherboard with no external fan mounts. 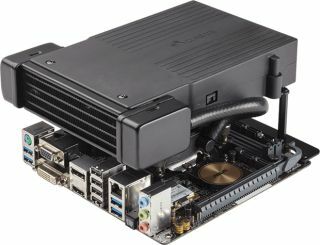 Corsair says that it's able to dissipate up to 150W of heat. The H5 SF's radiator measures 167 x 40 x 57mm, and the overall height is just 84mm. This combined with its flexible design means you'll be able to squeeze it into the tight spaces of a small form factor PC. You can grab an H5 SF on Newegg now for $80.